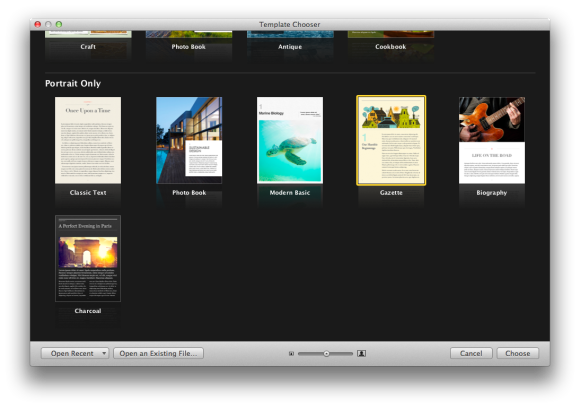 Originally released in early 2012, Apple’s education-themed ebook creation tool took bold steps as the first WYSIWYG program to export an ebook just as its author envisioned it. 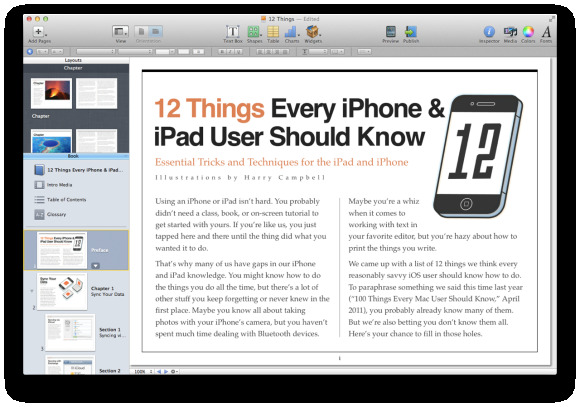 As I noted in my review of that software, however, the first version of iBooks Author was very much a 1.0 product, with strange omissions and odd workflows for users who didn’t want to build textbooks. Ten months later, an updated version—iBooks Author 2.0 (Mac App Store)—brings simplified tools, new templates, portrait-only options, and a better publishing workflow to the table. Naturally, I couldn't resist taking the updated program for a spin. Though Apple’s software still clearly slants toward the education market, this second version of iBooks Author acknowledges that people might want to create other styles and types of books. The template chooser offers three new landscape templates: Photo Book, which emphasizes big images alongside text; Antique, reminiscent of an old storybook; and Cookbook, self-explanatory and nice for authors planning to publish or collect recipes. In addition to the three new landscape templates, iBooks Author introduces portrait-only templates, which seem to be aimed toward Apple’s new iPad mini. Most of the new portrait-only templates skew away from the textbook design, instead targeting specific reading genres: Biography and Photo Book offer basic designs for those book types, while Gazette, Classic Text, and Charcoal take their cues from storybooks and picture books. Modern Basic is the lone new textbook-style template, and even it leans more toward minimalistic how-to than full-fledged instructional manual. In total, the program offers nine new templates (though you can always purchase additional templates from non-Apple vendors or create your own in-program). 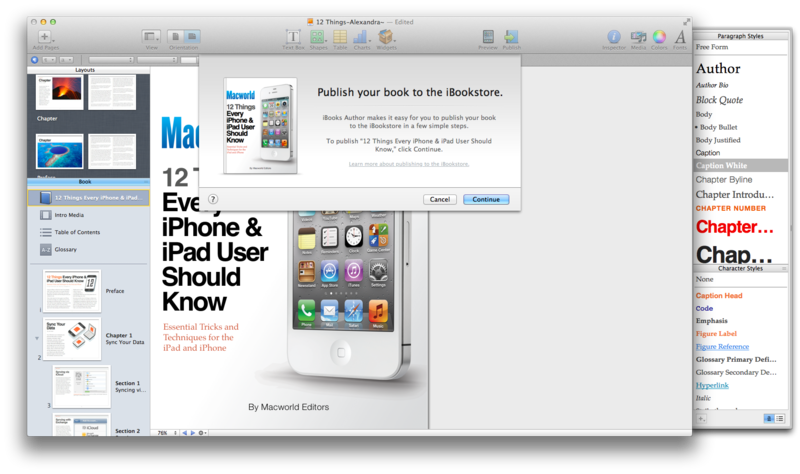 iBooks Author 2.0 offers several portrait-only orientation choices. Unlike landscape-oriented books, which show reflowed text in portrait orientation, the new portrait-only templates are fixed-format and thus have a fixed font size. 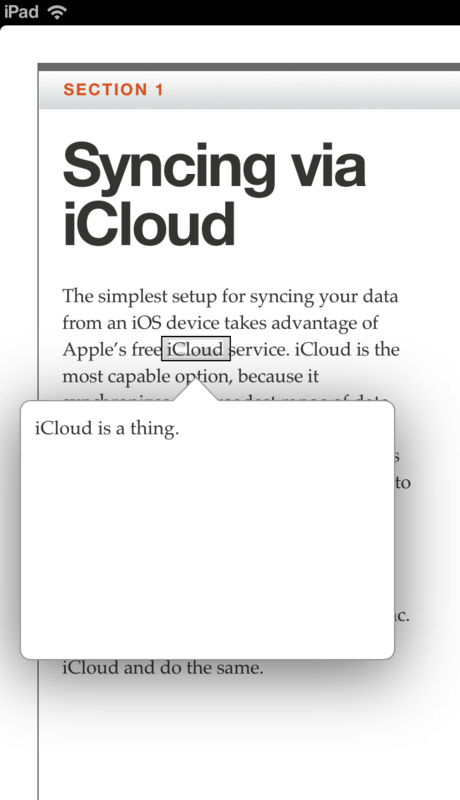 This may explain why iBooks Author continues to bypass the iPhone and the iPod touch: Fixed-format book text can look outrageously small on the 4-inch screen of an iPhone 5 or iPod touch. 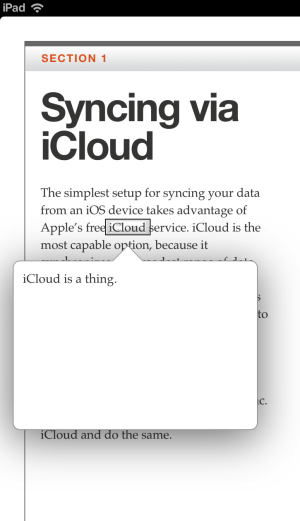 That said, if Apple's concern involves disappointing customers with small text, I'm confused as to why it allows publishers to sell iPhone versions of non-iBooks Author fixed-format ebooks on the iBookstore, rather than disallow anything but flowing text on its smallest devices. As it stands, iBooks Author is a segmented product—one that can only serve half of the iOS devices Apple makes—and that keeps it from being a truly compelling tool for the majority of iBookstore publishers. The Pop-Over Widget lets you hide the pop-over behind text. iBooks Author debuted with a decent number of interactive elements; in 2.0, Apple tacks on Pop-Over and Scrolling Sidebar options, adds support for LaTeX and MathML mathematical equations, and tweaks the Audio widget. Widgets let you add creative touches to your book. The Scrolling Sidebar widget gives you a nice way to present extra content on a single page: It should be useful for elements such as tips and helpful notes within a how-to book; users will undoubtedly come up with other creative uses for it. 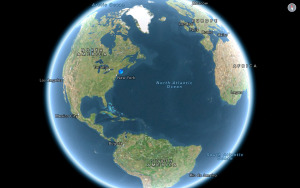 One other neat thing: The Sidebar and Pop-Over widgets accept both images and text. I couldn't test iBooks Author 2.0’s LaTeX and MathML integration thoroughly, as I have little experience with mathematical equation programs. 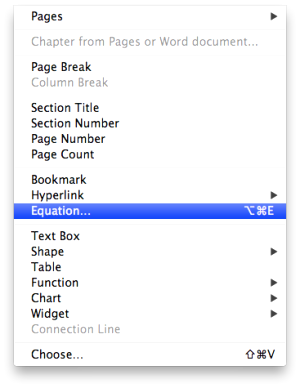 If you're interested, however, Apple has a document on its website detailing the terms that iBooks Author’s new Equations prompt will recognize. Inserting an equation seems fairly simple: Go to the Insert menu, click Equation, and paste in your LaTeX or MathML code. The new Equation feature lets you add and edit equations. Users who like to embed audio in their books will appreciate the Audio widget’s new formatting options: In addition to the traditional play button, you can display a scrubber or disguise the audio button as an image. 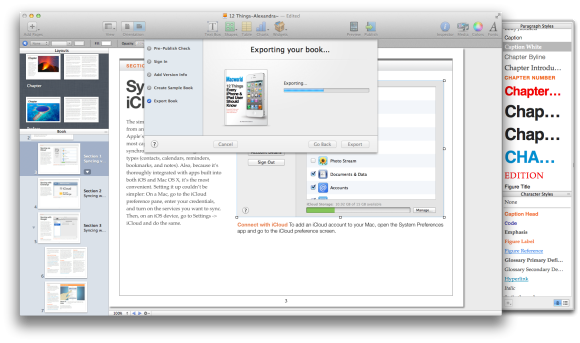 You still have to export to iTunes Producer to publish your book. 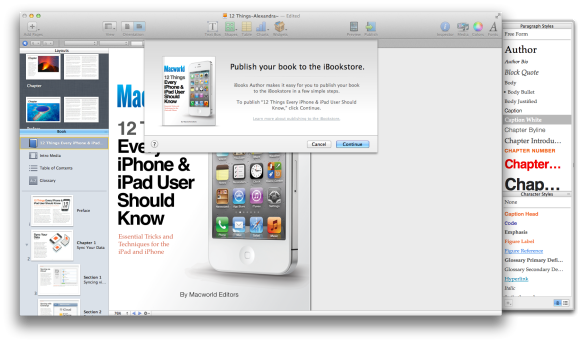 Here’s what you can expect from the new Publish option: Instead of booting you immediately to iTunes Producer after compiling your file, iBooks Author routes you through a five-step process. The app performs a diagnostic check of your file to confirm that it’s properly compiled, and then it asks you to sign in with your iTunes Connect account. After that, you have the option of indicating whether the book you’re making is new or an updated version. Choose 'updated', and iBooks Author will pull up a full list of every title that you’ve published on the store—a pretty neat improvement. You can choose the appropriate title, add a version increment, create a sample book, and then export your book to iTunes Producer for final checks. Publishing books in five steps. 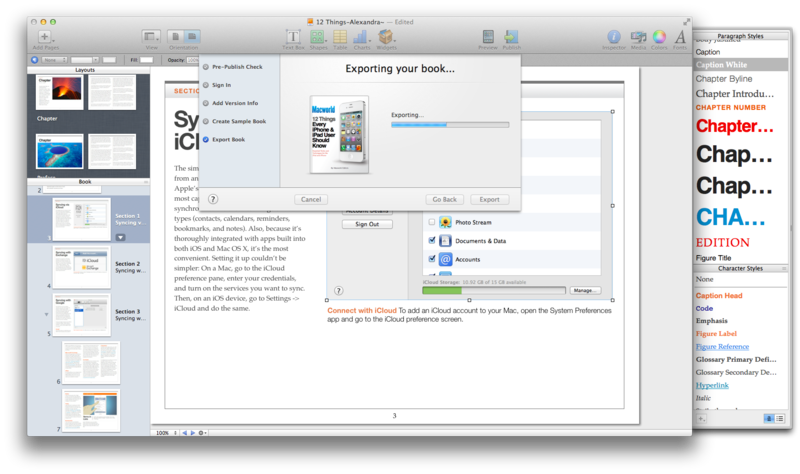 The problems involved in updating existing books arise once you reach iTunes Producer. The app populates the record with only the information you can edit in this update (the title and the page count), instead of graying out metadata that you’ve already entered. This approach has the side-effect of inducing panic in nervous authors—Oh no! Did iTunes Producer lose all my data?—and it may lead users to (needlessly) add all of the missing information into the record, just to make sure that the unseen data doesn’t get overwritten with blank text. In addition, you have to reenter your territory information and pricing—not the most enjoyable task in the world. And strangely, iTunes Producer lacks a version field, so you can’t confirm that you are, in fact, uploading a new version. Don't get me wrong: I love the idea of simplifying publication, but these changes seem to make the process more complicated. Among the other welcome additions to iBooks Author 2.0 are custom fonts, tapping objects to make them full-screen, and media optimization. 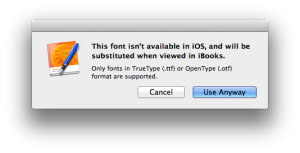 Custom fonts: iBooks Author can embed any TrueType or OpenType font (those with a .ttf or .otf extension) into any book that you choose, and the process is as simple as opening the Font Picker or the Text Inspector and selecting one. If you choose a font that doesn’t have a TrueType or OpenType version, you’ll get an error message informing you that, if you use the font, one of the iPad’s system fonts will automatically be substituted for it. You can embed only TrueType or OpenType fonts. Note: When you pick a compatible font, the program doesn’t police for copyright; so make sure before publication that you have the necessary rights to use the font in a book, lest you run into legal complications down the road. Full-screen objects: Hidden away in the Widget Inspector is a checkbox for making objects full-screen when tapped. A few caveats: The object will expand only to the width of the screen, and you can’t pinch to zoom—that gesture will instead close the full-screen and return you to the book page. Media optimization: iBooks Author 2.0 automatically converts your audio and video files to an acceptable format when you add them to your book. This happens in the background, though you can’t publish your book until it’s done. Serenity has been writing and talking and tinkering with Apple products since she was old enough to double-click. In her spare time, she sketches, writes, acts, sings, and wears an assortment of hats.